Well how would all the humans get off this planet? They probably wouldn't in time, that's the point. Our lifespan is limited, and after demographic transition population will slowly start to dwindle anyway. It is not a gradual solution, but the fact is, humans shall migrate into space, with or without Earth intact. More gradual way would be constructing space-oriented energy logistics, for starters - energy is going to be the major resource in the future, and there's a lot of it out there in space. Problems like space rockets and debris are relatively easy to solve, they are no match for ecosystem sustainability problem. I think we should start reducing our population, number of nukes and make peace with other nations so eventually the world will be united. I do not care which way it will be achieved, I only care that it shouldn't be a morale-shattering act of treason of human nature, where least of humanity gets everything and the rest of it gets nothing. Which is entirely different problem, actually. I really would like it if all the budget we spend on war would just go into space - however low the investments return rate is for most of the space exploration, it is still better way to spend it. With all these news about Proxima b and the boost for the Breakthrough Starshot project, I decided to make a calculation for the prospects of us, Space Engines fans to one day have in our hands, data and images of other stellar destinations. I will use the Forum Age Poll to establish who reaches to see what in the future, among the most well known forum users (considering when they posted their age). And I will use the list of nearest stars from wikipedia to establish the targets. We all live 100 years. I know it's a creepy issue to show in a post this kind of information and maybe you are not entirely delighted by picture (tell me if you want to edit the post so you are not showed), but I think that as scientific minds we have to be confortable with this ideas. In other way I hope this becomes something to inspire your children or other young people that are in the forum, because they are going to see the milestones of the historical exploration of the Solar System's neighbourhood!!! The Breakthrough Starshot project starts sending nano-spacecrafts in just 20 years. This is the optimistic side of the realistic range, so it's not a bad assumption. The project scientists themselves are convinced that this would be the time needed to reach the technological advances. All the nano-spacecrafts are sent simultaneously. Once the technology is available in 20 years and the laser grid is deployed it would be fairly easy and cheap (the cost of an iPhone) to produce in mass this space-chips and send them continuosly in a brief time period to all the destinations. I consider this so because for the first mission (to Proxima Centauri) they talk about sending 1000 of this nanocrafts in a period of one week (to beat by number the posible loss of many of them by micro-collisions with interstellar dust), so they must consider quite easy to make many of this for other targets in the inmediate future. The nano-spacecrafts travel all the way at 20% the speed of light. This is the assumption the project scientists make for the top speed of their probes. The acceleration from 0 to that speed would take 10 minutes so it's a totally reasonable aproximation to consider it to start the voyage at that speed from the first moment. 2038 - Flyby of U (if it turns out to be a small ultracool brown dwarf or before if it turns to be a planetary body closer to the Sun), an extreme transNeptunian-object that lies in the line between the Alpha Centauri system and us, yet to be characterized. 2062 - Exploration of the Alpha Centauri system, first flyby of a binary system, first flyby of a star bigger than the Sun (Alpha Cent A), possible flyby of the second and third exoplanets in history (Alpha Cent Bb and Alpha Cent Bc). 2072 - Exploration of the Barnard's Star system, the star with the biggest propper motion from Earth. Second red dwarf explored (but this time withour been a flare star). 2072 - Exploration of the Luhman 16 system. First and second flyby of a Brown Dwarf (first L type and first T type brown dwarfs explored), second flyby of a binary system, flyby of a possible planet (yet to be confirmed) around one of the brown dwarfs. 2079 - Exploration of WISE 0855−0714. First flyby of a sub-brown dwarf star (Y type brown dwarf) or maybe the first flyby of a Rogue planet. 2083 - Exploration of the Wolf 359 system, a red dwarf flare star with less than a billion year of history (first young system flyby). 2086 - Exploration of the Gliese 411 system. There are posibly two exoplanets in this system (yet to be confirmed). 2087 - Exploration of the Sirius sytem (brightest star in the Earth's sky). First flyby of a White dwarf (Sirius B), first flyby of a A-type star (Sirius A) and third flyby of a binary system. 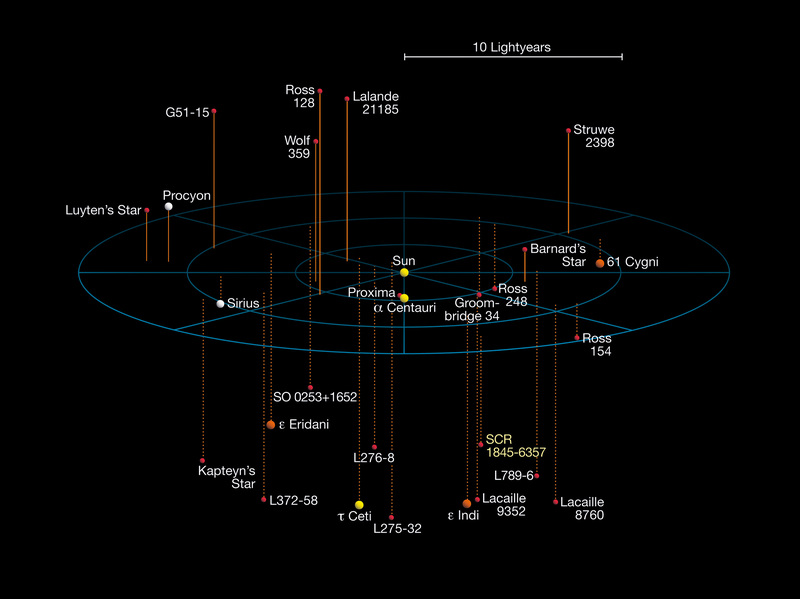 This is the youngest system explored by the time (just 230 Myr old) and Sirius A is the most massive star explored until now (2 solar masses). From it's radial velocity (5 km closer to the sun each second) I've estimated that at the time of the arrival of the probes it would be 0,01 light year closer to us (the arrival date dosen't change with this minuscule amount). 2088 - Exploration of the Gliese 65 system. This is a red dwarf binary system where both are extreme flare stars (one of them increased its brightness by 75 times in only 20 seconds one time) so one of the most extreme fluctuating enviroments explored at the time. 2094 - Exploration of Ross 154, another solitary young red dwarf. 2098 - Exploration of Ross 248, another solitary young red dwarf. The star is getting closer at 81 km/s so the probes would arrive 44 days before than expected. 2099 - Exploration of the Epsilon Eridani system. Exploration of the second confirmed by now exoplanet, AEgir (first flyby of an exotrasolar giant planet) and a, yet to be confirmed, Epsilon Eridani c exoplanet. It would be the first flyby of a protoplanetary disk (there are two asteroid belts at 3 AU and 20 AU from the star and a dust-cometary belt at 35 AU). The star is a young Sun with 40 times stronger magnetic field and 30 times stronger stellar winds (so it's a perfect candidate to slow down the probes with some electric sail breack manouvers and make orbital insertion). The system is probably full of recently formed planetesimals. 2100 - Exploration of Lac 9352, another solitary young red dwarf. 2102 - Exploration of Ross 128 another solitary old red dwarf. It's galactic orbit is very eccentric so it would be the first star that has been near the galactic bulge to be explored. 2103 - Exploration of WISE 1506+7027, the fourth flyby of a brown dwarf in history. 2104 - Exploration of the EZ Aquarii system. First flyby of a triple star system. The same year we also explore the Procyon system for the first time. First flyby of an F-type star and second flyby of a white dwarf. From 2105 to 2116 - We explore 61 Cygni binary system, Struve 2398 binary system, Gliese 15 binary system (with another confiermed exoplanet), the trinary system Epsilon Indi (wich has a yet to be confirmed planet and two brown dwarfs), DX Cancri system (that is just 200 Myr old and probably has a circumstellar disk), Tau Ceti (with flybys for the 5 super-earths we know it has, including two of them in the habitable zone of the star), GJ 1061, WISE 0350−5658 (second Y type brown dwarf to be explored), YZ Ceti, Luyten's Star, Teegarden's star (with a planet yet to be confirmed), the binary SCR 1845-6357 system, Kapteyn's Star system (that is 11 billion years old and probably a star of the ancient dwarf galaxy Omega Centauri) with its two confirmed exoplanets (one of them been probably habitable), AX Microscopii (the brightest red dwarf we know of), WISE 0535−7500 (maybe a rogue planet), Kruger 60 binary system, DEN 1048-3956, UGPS 0722-05 and the binary system Ross 614. 2126 - We explore the limits of the Local interstellar Cloud. 4436 - Flyby of RX J1856.5-3754 (the closest Neutron star, and maybe even a candidate for Quark star). First flyby of a Neutron star. 6320 - Exploration of the Helix nebula (the nearest planetary nebula). First flyby of a planetary nebula (it would take 17 years to traverse it from one side to the other). 18836 - Flyby of V616 Monocerotis (nearest known black hole). First flyby of a black hole. This was all considering that we don't manage to increase that 20% of the speed of light for the probes during the next centuries. Imagine that 20 years after the first probes are lunched we archive the power to put new nano-sails at 30% the speed of light. In that case all the destination of the list that where going to be reached before 2108 are reached first by the old probes (so nothing chages in the timeline before that year) and then by the new faster ones. But the destinations after that date would be reached far more rapidly by the new probes (this would make scientist wait until the technology is avaiable for all the destinations that are planned to be visited after 2108). This is a typical Wait Calculation. So consider the last part of the list something not very precise by the moment (but why care? almost all of us are going to be dead by then). I should also point that any mission enduring more than 100 years would not be undertaken because it would be surpassed by a future mission before the arrival to the destination. Long term mission would have also the problem of durability of the electronics and instruments over those periods so maybe we would wait even more for missions to have the right technology for greater speeds, so it not only gets obsolete but also damaged as gets old. Another interesting thing is that the rate of targets explored would be constantly increasing even if we don't manage to get beyond the 20% of the speed of light, never. This is because the volume of a sphere has a cubic dependence with the radius; at a distance of less than 20 light years you have 8 times more stars than at a distance of less than 10 light years (and not two times). So, if we lunched all the nano-sails to all the known stars of the galaxy, the first years would be boring, maybe one or two new stellar systems encountered per decade but the number of discoveries would increase enormously the next decades (while the layer of probes expand the surface of that imaginary sphere centered on the solar system) having for the decade of 2106-2116 nearly 27 new stars systems explored (a new stellar system explored each 4 months), and for the next decade the exploration of new stars would grow. Eventually in a two centuries we could be exploring 1 new stellar system per week!!! We all live 100 years. Just makes me hope aging is treatable eventually because that whole dying thing doesn't sound very fun. doc is right! why to die when we are in the peak of our space exploration!! Your assumptions look reasonable, but there is one small flaw in that Watsisname will never die. His body may betray me and return to the Earth but my spirit is eternal and dances among the heavens. I am the avatar of Wat, the Creator and Destroyer. You will know my name and know ruin, the extinction of the stars and evaporation into the infinite void. See you at heat death, my friends. Where am I in that timeline? FastFourierTransform, had fun reading all this. There is always the possibility of reversible aging or cybernetic augmentation to replace deteriorated biology. Hahahahaha. I knew that all the discussion would be around the dead issue. Okay you win. No one here dies ever! hahahah. LiveLife42---> die. Nothing wrong here. Well, maybe I materialize as a Boltzmann Brain one second in that system one day so I don't totally worry about this. what if in 50 years or so we will discover warp drive. then you can explore any system you like! what if we will create organs to Replace in our body? what if we invent super robotic legs to replace our old broken lame biological legs? I'm 13-16 Not telling the exact age. steeljaw354, You posted it in the wrong thread..